One of the reasons I want to share my shopping experiences for clothes is because I have such a hard time finding things that fit me. I dread shopping because of it. I never considered myself that out of the norm but supposedly the average women is 5’4” and somewhere between 140 and 160 pounds. I guess at 5’9” and BMI in the normal range (you don’t need to know every detail!!) I don’t fit the ‘norm’ that clothes are made for. By sharing stores, brands or specific pieces that work for me and even ones that don’t, I hope I can help others on that taller side of the average take some aggravation out of shopping. Smaller people say it’s an issue too but if something is long you can have it altered, roll up sleeves, knot the bottom of the shirt…which is apparently back in style by the way. When you are tall you can’t magically add material to make a shirt long enough to cover your waist or rear for leggings or make a long sleeve actually long and not ¾ length or when wearing heels have the pants hit that top of foot to hang right. This was my 8th fix. If you recall my last one didn’t go so well. My stylist for this one, Jen, left me a nice note about reading my feedback and checking my Pinterest board and she hit the nail on the head! While I don’t do Stitch Fix that often, maybe a few times a year, for some reason the clothes seem to fit me well. I don’t always care for every piece but they fit. Even my last fix, which was a far cry from cozy winter which I requested, the items fit nicely. I suppose that’s why I keep coming back when I do ‘need’ to shop. Believe me, many times the price tag gives me a little punch in the gut however, I am at the point now where the driving, time and aggravation isn’t worth a few dollars I may save elsewhere. When I find something I like and that fits well I just need to roll with it. To a degree, anyway! I actually received this fix back in early April and was preparing to travel a lot. I was keeping it all so I didn’t bust my rear to fit time in to get pictures of everything for a post. The only thing I specifically asked for was a distressed pair of jeans. I’ll say it again, I feel the more vague you can be with requests the more likely you will get something you like. Is it too hard to ask for a pair of jeans that an hour after you put them on they aren’t stretched out so much they are practically falling off? Did I never notice this happening before? Is it because your body changes after kids…or because you’ve stepped it up a notch on the fitness/eating arena? Maybe all of the above! I don’t know but for some reason every pair I own is doing this. The pairs I wore most often weren’t inexpensive either, I had been going to The Buckle because they have multiple lengths. I am so tired of having to pull up or adjust my pants every time I bend over, squat or stand up. Surely this can’t be something we just have to live with. I don’t buy that we ‘just have to live with’ anything in life but that’s a different topic! First up is a complete outfit! I got the distressed jeans and let me tell you they stay put! I wear them all day and have never had to hike them up. Tank: Market & Spruce Belissa Ribbed Detail Knit Top size small. This is a great top to have in the closet. It can be worn in the summer alone casually with shorts or, like I have here with jeans and a cardigan or even dressier for business casual with slacks or a skirt and layering. It’s a great length if you are taller or have a longer torso. The style card has this pared wtih jeans and a white short sleeve cardigan. It is also pared with a grey and white stripe skirt and jean jacket. Cardigan: Pixley Jann Sueded Patch Open Cardigan size small. This is another great piece to have as you can wear it so many different ways. The detail is hard to see in pictures but it has suede on the bottom side of the arm that goes about half way to the elbow. It adds just a little something different. Another plus is that it’s long enough for to wear with leggings!! The style card has this with a white and blue tank and jean shorts as well as jeans and a frilly tank. Next up we have another top that can be dressed up or down. This top is a heavy weight though so not one I’ll grab when it’s 90 degrees out. The white detail pairs well with white shorts or pants but is also versatile enough to pair with jeans or other colors of shorts for dressing up or down. Top: Daniel Rainn RoRo Embroidered Cold Shoulder Knit Top size small. Shorts: These are not new and are from The Limited. The style card has the tank paired with the same jean shorts mentioned above, cute sandals, straw hat and sunglasses. It also has an olive skirt and jean jacket. I’m not sure about that pairing though. Finally we have another top that can easily be dressed up or down. The detail on the sleeve is hard to see but it’s a pretty lace cutout from the shoulder to the end of the sleeve. I didn’t want to add jewelry in the picture but a long necklace would be great with this top. This can easily be paired with any type of bottom to dress up or down. Top: Loveappella Swindell Lace Arm Knit Top size small. Jeans: Calvin Klein Skinny Ankle Denim from Amazon size 28. These were from my Amazon Prime Wardrobe box around the same time that I received this fix. You can go back and see all of those items too in my Amazon Prime Wardrobe, Bust or Must? post. On the style card this is paired with the same jeans mentioned above and an army green vest. It also as another one I’m not sure about, a pink and black floral skirt. It does have super cute pink heels with it though! At the time I was really just on the hunt for some jeans that stayed put but all of the tops in this fix ended up being great and I’ve worn them multiple times already. I did also find other jeans at Nordstrom Rack that I will be posting about in the future! 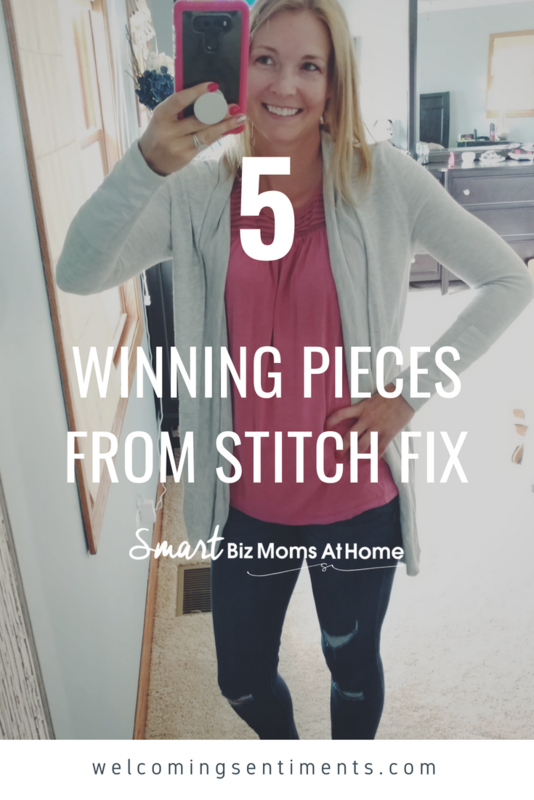 If you’ve never tried Stitch Fix you should. I have not had an issue with quality over the years and the brands they have really do fit well. You can click here to schedule your next or first fix. Disclaimer: some links in this post may contain affiliate links which means if you click through and make a purchase at no additional cost to you I will receive a small referral commission.